A sinful treat that is so very easy to create. Slice strawberry in half and dip all cut sides in sugar. This will prevent early spoiling of the strawberry. Place cut sides of each strawberry down so that it creates a heart shape. Push a toothpick through the sides to give you a solid heart form that won’t move. Melt chocolate chip (of your favorite type) in a slow cooker on low. 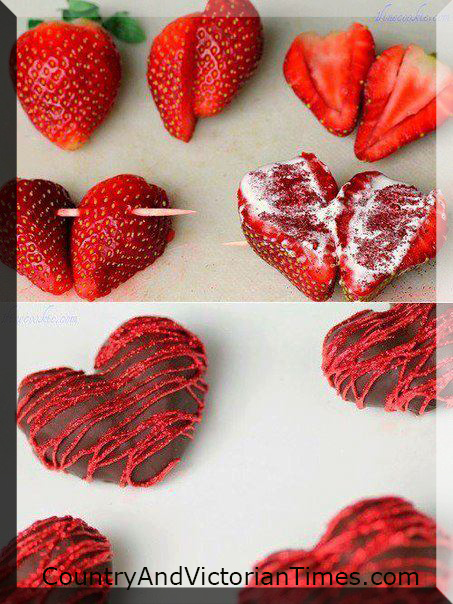 Use tongs and dip the entire strawberry into the chocolate. Place on wax paper to harden. Then drizzle colored icing or a different type of chocolate across and immediately sprinkle sugar or colored sugar or sprinkles or edible glitter on top. Tap off excess. Enjoy! This entry was posted in Crafts ~ DIY ~ Projects, Recipes, ~Dessert, ~Edible, ~Holiday, ~Party, ~Snack, ~Valentines Day, ~Wedding and tagged candy, chocolar, dark, day, sprinkle, sprinkles, strawberries, strawberry, suga, treat, valentines, white, ~Party, ~Wedding. Bookmark the permalink.